The airport is situated in Rhoose, 12 miles west of Cardiff City Centre. Exit Junction 33 on the M4 and follow the A4232. Take the first exit off the A4232 at Culverhouse Cross and follow signs to the airport along the A4050 and A4226. From the North take the M5 down to Junction 15 and then take the M4 across the Severn Bridge, to Junction 33. Both Short and Long stay parking is available at the airport, with a courtesy shuttle bus from the Long Stay car park to the terminal. 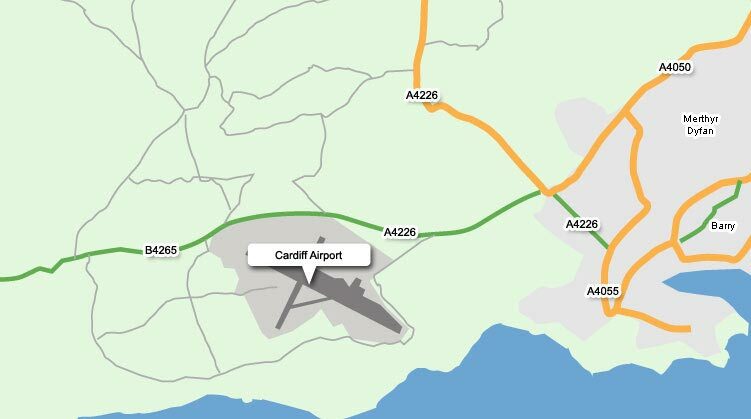 If you are travelling to Cardiff Airport by car then you will need a map to follow for directions. Directly outside the terminal, you’ll find the Drop Off area. This is Free for 10 minutes – any time exceeded after this will be charged at £5 for every 10 minutes extra. Please be aware that this is for Drop Offs only, not for Pick Ups! If you need a little longer, you’ll find a drop off/pick up zone in Long Stay Car Park 1 where the first 20 minutes are Free. The pick up zone is located in the Short Stay Car park and is £1 for 20 minutes. Alternatively, you can use the drop off / pick up area located in Long Stay Car Park 1 which is a short walk from the terminal. The charges above are also applicable here. Parking through Airport Parking Shop and save up to 60%!